The cold fog creeps around your legs as you walk down an ancient street, a stone fence looming ahead of you. The darkness around you is so intense you feel as though you could scoop it into your hands and carry it with you – though that is the last thing you want to do as it presses in on you. As you walk you are aware of the sound of your footsteps. Suddenly, another sound joins your steps. It is the sound of hooves, galloping in the near distance. They are coming closer, but you can see nothing beyond you but the fog. A moment later you realize you are beyond the fence and have stepped into a cemetery. Many of the aging stones around you were etched nearly two centuries ago and just as a familiar name comes into view, a black horse and a mysterious cloaked rider rushes past. A moment later, the sound of the hooves is gone. The name on the stone before you is Washington Irving. 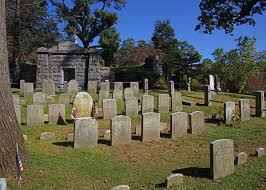 You are standing in Sleepy Hollow Cemetery in Tarrytown, New York, the final resting place of the brilliant mind who penned the ghost story for which this cemetery was renamed. 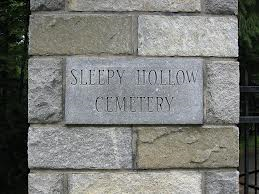 Though the tale itself was set in the tiny cemetery nearby, many who visit this burial ground speak of a black horse with a headless rider, the sound of disembodied hooves, and quiet whispers that surround them as they walk the pathways. For many, this is only confirmation that the tale that made this sleepy little village famous was actually based on the experiences of its author.